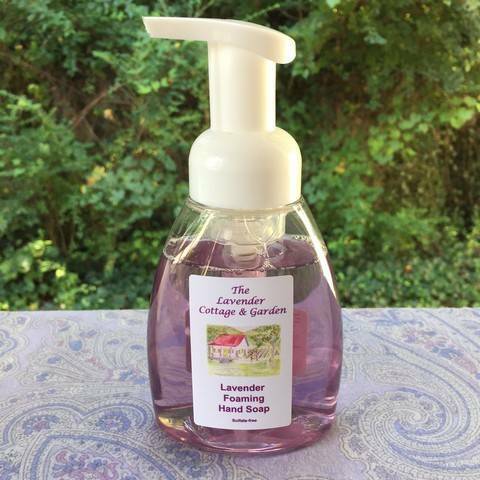 Our Lavender Foaming Hand Soap goes great in your bath or kitchen. The Lavender scent makes hands fresh while the foaming soap helps kill germs. Ingredients: Distilled Water, Aloe Barbadensis (Organic Aloe) Leaf Juice, Lavandula Angustifolia (Organic Lavender) Distillate, Anthemis Nobilis (Roman Chamomile) Distillate, Sodium Lauryl Sulfoacetate, Cocamidopropyl Betaine, Disodium Laureth Sulfosuccinate, Glycerin, Phenoxyethanol, Lavandula Angustifolia (Lavender) Essential Oil, Hydrolyzed Wheat Protein, Panthenol (Pro-Vitamin B5), Rosa Canina (Rosehip) Fruit Oil, Simmondsia Chinensis (Organic Jojoba) Seed Oil, Tocopherol (Vitamin E), Tetrasodium EDTA, (May contain sodium bicarbonate and/or citric acid as pH adjusters) 8 ounces.